Each decade we lose more than 27,000 children to childhood cancer, another 120,000 suffer impacts of treatments including secondary cancers. This picture has not improved much over the past 30 years and it will continue to change only incrementally, if at all, over the next 30 years, unless we do something to demand that our government invest in childhood cancer research. Each year Congress appropriates BILLIONS of our tax dollars for research, only a tiny fraction of that money goes to childhood cancer research. We must join together and let Congress know this is wrong, our children deserve better, 1 in 285 children will be diagnosed with cancer and I personally don’t like those odds. We must tell Congress that childhood cancer research should be a PRIORITY in the federal budget process. I came to this realization about the lack of childhood cancer research too late, but I want to change this story for the children who will be diagnosed today, tomorrow and in the future. Our lives were forever changed when our grandson was diagnosed with a rare form of pediatric cancer called AT/RT (atypical teratoid/rhabdoid tumor). Hearing that your child/grandchild has cancer is devastating, but hearing Doctor’s say that there are no treatments, no cures, no hope is incomprehensible. Doctor’s advised that we should take our beautiful Declan home, make him comfortable, and that he would be dead in a few weeks. There are no words to describe the shear horror of this moment and the days and weeks following. After a brave and courageous battle that included several brain surgeries, removal of his kidney, six weeks of proton radiation and many rounds of poisonous chemo, our sweet Declan lost his battle 8 days before his first birthday. Like so many Americans, prior to Declan’s diagnosis, I was blissfully ignorant about the reality of childhood cancer and its impacts. For over 30 years, I gave to pediatric cancer organizations and assumed that they and the federal government were doing everything possible to find cures and bring the best possible treatments to our children. I was dead wrong. Our children are paying the price for this lack of awareness and lack of childhood cancer research funding. 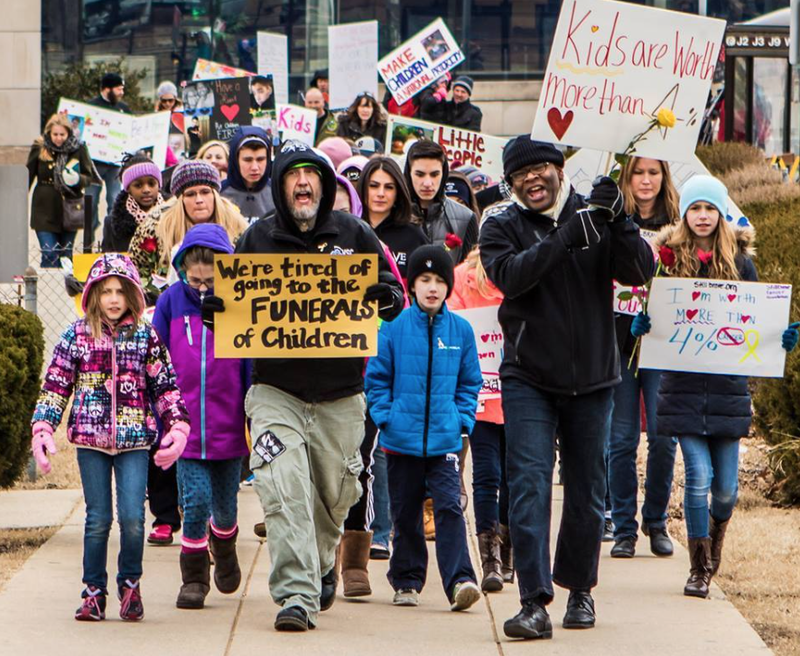 Children have no voice, no lobby, no money. Although kids represent 26% of the U.S. population, they can’t vote and it seems their needs fall to the bottom of the budget pile, especially where funding decisions are concerned. We must be their voice and demand change. The Facts – Childhood cancer is the #1 disease related killer of children in the U.S. The National Cancer Institute (NCI) says that childhood cancer is rare. They indicate that annually approximately 16,000 kids are diagnosed with pediatric cancer and that childhood cancer is on the rise. The American Cancer Society indicates that 1 in 285 children will be diagnosed with cancer, 1 in 5 children are terminal on diagnosis and 2 out of 3 children suffer life altering impacts as a result of treatments. According to NCI there are currently 380,000 survivors of childhood cancer in the U.S., they project this number will increase over time. Many childhood cancers ignored – There are 16 major types of cancer and over 100 subtypes. Many of these childhood cancers, like DIPG, AT/RT, receive little to no funding for research. The National Cancer Institute (NCI) indicates that survival rates for a few childhood cancers like acute lymphoblastic leukemia (ALL) have improved dramatically over the past decades (there is still work to be done and we should not stop research for ALL because of improved statistics). Ironically this improved statistics for ALL is due to the investment in research! Normally when NCI talks about improved statistics for childhood cancer and justifies their lack of investment, they make little mention of statistics regarding the deadly childhood cancers where for decades there has been little to no research. It seems to be acceptable that these deadly “rare” cancers where children are dying day after day, year after year, are offered little to no research funding. Childhood Cancer Organizations – Ironically many pediatric cancer organizations raising funds for childhood cancer research have been started by families who have children that have battled cancer or have lost a child to pediatric cancer. These families have suddenly been thrust into the horrible world of pediatric cancer and become aware of the lack of funding for childhood cancer research. Their new reality pushes them to try and find ways to fund childhood cancer research that brings cures, save kids and give them hope. Families desperately want other kids to have cures denied to their own children. The thing is that even the largest organizations are raising tens of millions of dollars. Childhood cancer research needs a huge investment, an investment of billions that will bring cures to the table in years rather than decades. This can only be accomplished by putting our tax dollars to work for kids. The Budget – The National Institute of Health (NIH) has a $30 billion research budget and the National Cancer Institute (NCI) receives about $5 billion of this amount for cancer research. Childhood cancer research is sadly neglected as budget decisions are made by the NIH/NCI. NIH has lamely defended their lack of investment by saying that research in adult cancers brings benefits to childhood cancers, childhood cancer is rare, there are insufficient resources to increase funding levels for childhood cancer research, if given more funding they would do more, and a myriad of other reasons from the brilliant researchers that make budget decisions. Another statement I find incredibly ironic are statements by the Directors of NIH, Dr. Francis Collins, about the budget stressor put on scientific opportunities, the throwing away of “innovative, talented research proposals” and the “serious risk of losing the most important resource we have, which is this brain trust, the talent and creative energies of this generation of scientists.” I would counter that NIH might consider the incredible opportunities that are being missed in developing cures for childhood cancer because of the lack of investment in research. Many innovative childhood cancer projects are being thrown away because there is no money to fund childhood cancer research. 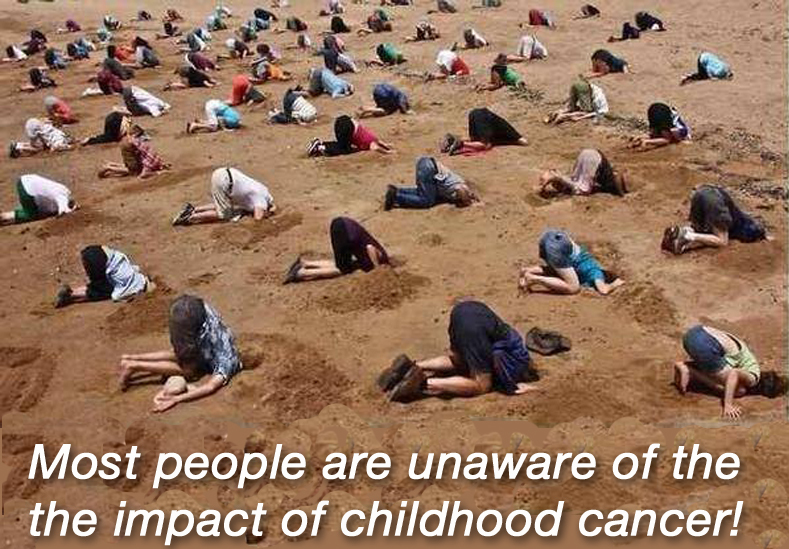 Finally, we have no idea about the brain trust of the 2,700 children that lose their lives each and every year, year in and year out, decade after decade because we are again doing no research or very little on those deadly pediatric cancers that are killing our kids everyday. They too are an important resource. NIH mention of Childhood Cancer is what’s rare – Childhood cancer research is not a line item in the NIH/NCI budget and is rarely mentioned, if at all. 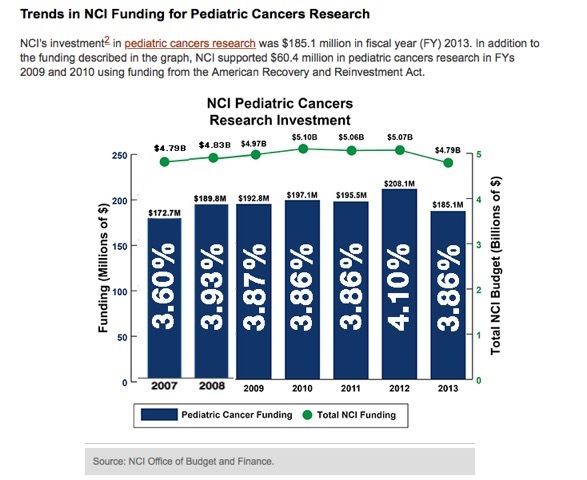 NCI indicates that in 2013, $185 million was for childhood cancer, this amount is not actually for childhood cancer research grants but calculated by percentages from grant projects that estimate their work might benefit childhood cancer. NIH Request for $1Billion budget increase – In the 2016 budget, NIH has requested a billion dollar increase, bringing their budget to $31 billion, on average a 3% increase for every institute/center. Documents indicate that key investments are for Alzheimer’s research, Precision Medicine Initiative, Antimicrobial Resistance, AIDS, the Brain initiative, etc. 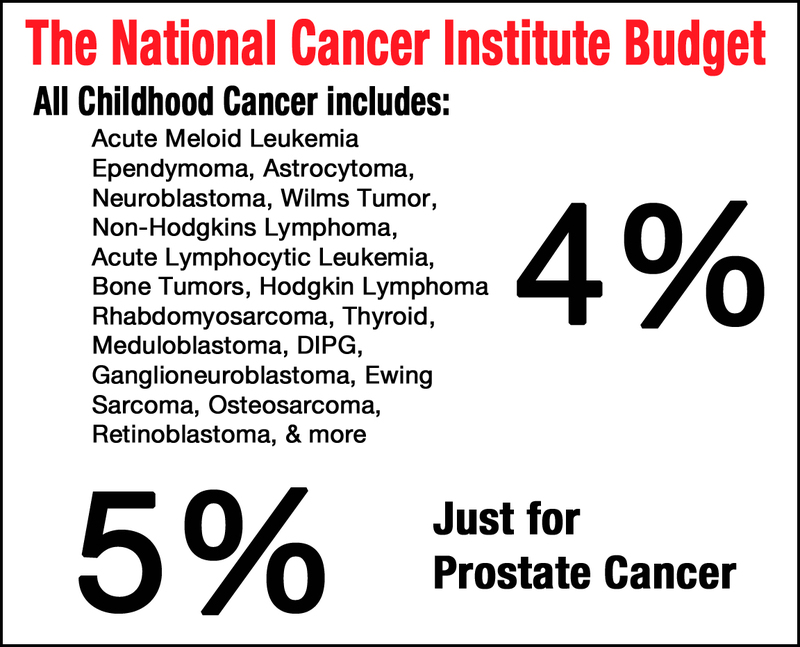 There is no mention of childhood cancer research in their budget request, it is not a priority for NIH. Following the AIDS pandemonium in the 1980s, Congress provided billions for AIDs research. Dr. Francis Collins, the Director of NIH has testified that success with HIV/AIDS research “may enable us to envision the first AIDS free generation since the virus emerged more than 30 years ago.” This success would not have been possible without the substantial investment of dollars in AIDS research, an investment of tens of billions of taxpayer dollars over the last few decades. This is not to say the level of AIDS funding is wrong, but to demonstrate that a significant investment could bring real change to the childhood cancer picture. Since 1980 approximately 75,000 children in the U.S. alone have lost their lives to childhood cancer. It is unlikely that this picture will change unless significant federal research dollars are invested in childhood cancer research to develop pediatric drugs, cures, treatments and protocols. I would love to see Congress provide that $1billion increase to the NIH 2016 budget, but legislate that childhood cancer research should be a priority and appropriate this $1billion increase for childhood cancer research. Even a legislative requirement for NIH to provide a negligible decrease to every line item in the NIH budget for childhood cancer research as part of developing their operating plan could make significant funds available. Childhood cancer research deserves to be a national priority. No parent should have to hear the words, there has been no funding for research, there are no cures, treatments or protocols. If you are interested in the hearing schedule for the House and Senate appropriation budget deliberations, you can find detailed information by going to house.gov and senate.gov, selecting appropriation committee, selecting appropriation sub-committee for Labor, Health & Human Services, Education and Related Agencies. Here you can find information about committee members, hearing schedules and requests for witnesses and testimony for the record. Together we can create change that will fund research and bring cures to kids. This entry was posted in Cancer, Childhood Cancer, Pediatric Cancer, Rare Disease and tagged acute lymphoblastic leukemia, AIDS, ALL, Alzheimer’s research, Antimicrobial Resistance, Appropriations Committee, AT/RT, Brain initiative, chemotherapy, Congress, Declan Carmical, DIPG, Dr. Francis Collins, Dr. William Carroll, federal research dollars, Health & Human Services and Education, hearing problems, heart problems, infertility, Labor, learning disabilities, National Cancer Institute, National Institues of Healt, NCI, NIH, Precision Medicine Initiative, secondary cancers, Senate, StandUp2Cancer, stunted growth. Bookmark the permalink. One thing that other groups have done is to provide a pre-written letter that people can input their name and email address into and it will automatically be routed to the correct govt. reps. In the absence of this, do you know what hashtag to use to send Twitter messages to these representatives? How to obtain their addresses, etc.? My granddaughter is almost a two year cancer survivor of stage 4 Hepatoblastoma. I completely understand, first hand, the need for more funding for childhood cancer research and updated protocols….instead of “watered down” adult chemos and protocols that haven’t changed since the 50’s. Thank you for this very well written post! In the next few weeks Congress will be making decisions about the 2016 budget for the National Institute of Health (NIH) and the National Cancer Institute (NCI). Although they have requested a $1 billion increase to their budget to support Alzheimer’s, the Brain Initiative, AIDS research, etc., they have requested no increase for childhood cancer research. I am writing to you to ask Congress to make childhood cancer research a priority in the Federal budget, and especially in the NIH budget request. Childhood cancer is the #1 disease related killer of children in this country, we lose thousands of children year in and year out. Little to no research funding is provided to the deadliest childhood cancers. This picture is not improving and while the brilliant work done by NIH leads to an “AIDS free generation,” we continue to lose and maim children with antiquated treatments due to the lack of research. We lose 27,000 children each decade to childhood cancer, tens of thousands more suffer life altering impacts of treatment, 1 in 285 children will be diagnosed with cancer. I personally don’t like these numbers or consider it rare. NIH cites many reasons for their lack of investment – stating that research in adult cancers brings benefits to childhood cancer, childhood cancer is rare, there are insufficient resources to increase funding levels for childhood cancer research, if they had more money, they could do more. This is not a matter of more money, but a matter of priorities. Many scientists and StandUp2Cancer dispute the idea that adult cancer research brings the needed results for childhood cancer research noting, “Children are not simply smaller versions of adults, and childhood cancers are very different from cancers that strike adults.” The NIH director talks about the loss of “innovative, talented research proposals” because of lack of funds. I believe there are many childhood cancer research proposals lost because childhood cancer research receives only negligible research funding. An article from The Atlantic in January 2013 talks specifically about the lack of funding for childhood cancer research, noting that 96% of childhood cancer grants don’t get funded because of the lack of funds and that it is driving people out of the childhood cancer field. Congress has suggested that NIH increase funding levels for childhood cancer research over the past several years, they have mostly chosen to ignore this “suggestion.” I ask Congress to legislate that NIH significantly invest in childhood cancer research, funding that will provide the opportunity for some of those talented childhood cancer research proposals to turn into cures for kids. I think all Americans understand the budget dilemma but again this is a matter of priorities, not more money. Personally I would like to see Congress designate the $1 billion increase for childhood cancer research or require that NIH tap every line item by 3% to come up with a significant increase for childhood cancer research. Our children deserve the best we can give them. Thank you for your work on behalf of the American people. I look forward to your response on this issue. Please help these children. My cousins 4 year old son was diagnosed last month Neuroblastoma, he has under gone chemo as surgery was impossible to do from where the cancer was at. Thank you Janet. So very sorry about your cousin’s little boy … will keep him in our prayers. You can help to by calling, writing, emailing Congress … tell them that we need more funding for childhood cancer research. You can also help by spreading the awareness about the lack of funding and corresponding lack of research — with research we can give kids cures and hope. Please continue to spread the awareness! Thank you again. Very well put.. very well said. We need to speak up…. pure and simple. As adults we do have that Responsibility for the kids. In regards to increasing the funding for Childhood cancer, we can… we Must.. WE WILL change things.